Shiatsu? That’s a dog, right? Or… how to combine Japan, India and France into one experience? WARNING: this post is more sensible than the last one. Apologies in advance. What is it? Can I get away with saying “acupuncture meets massage”? This is hopelessly inadequate, but it gives people a rough idea and dispels any idea of dogs, raw fish, paper-folding or any other lazy Japanese stereotypes. It treats the body and mind via meridians and pressure points.. I will stop there before you switch off. What’s it like? Trying to explain how it feels is like trying to nail water to the wall. Every person is different, every treatment is different, and each reaction to the treatment is different. 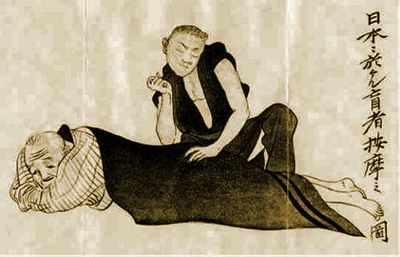 Unlike a massage that simply follows a procedure, shiatsu requires diagnosis and paying attention to the receiver. This attention involves constantly monitoring what is happening and adjusting accordingly. That’s enough theory for now. It is what it is. What’s it for? Obviously muscles and joints and surfing-related injuries. It also can work well on hangovers (although a fast-track Liver stimulation can be a tad intense for some directors) and even on releasing deeper emotional tensions (should you feel that your holiday is the best time to let such stuff go). But for most people it is pleasantly relaxing, they can’t believe they’ve been lying there for more than about five minutes, and they appreciate a glass of water to return to their bodies. Chances are they don’t immediately jump up and decide to go for a run. Anyway … there I am, having the job of my life: getting to meet lovely people, getting to work with lovely people and being in lovely sunshine and lovely waves (that’s enough of the “lovelies” for now)… and I mention shiatsu. I find a volunteer willing to be pressed, and it all starts from there. I’m doing what I love, and others are benefiting. Hmmm… others benefiting. I wonder …. I could not justify making money for myself from shiatsu. After all, I was in the best job, in a great climate, surrounded by brilliant people, and getting paid to spend all day grinning because I cannot believe my luck. They even had a bottle of Old Nick behind the bar, my life was complete. Maybe I can use my shiatsu to help even more folk to benefit? Way back in time, having just decided that a degree in Business had merely been an excuse to destroy vital organs in freelance alcohol research, I ended up in India. Impressed with the country, I decided I would help set up an orphanage to combat the abandonment and infanticide I was discovering. This home is still running, still helping children, and always needing funds. So… why not allow people to help the children out? By the end of the season the orphanage was up £300, people had come away feeling all floaty and chilled, and I felt most righteous in myself. If I may be permitted a bit of self-publicity here, I will be back in 2016 doing the same thing, fitting it around my other stuff. Appointments will be held between the hours of “drekly” and “inshallah” (that’s feral time, not clock time) and will last for approximately as long as they do, depending on when they start and finish. Feel free to book me up.